I am extremely pleased with how the textured turned out, and am even happier that I now have the completed textures from Bones. I also whipped up some light sources for these renders, along with some spec maps. OMFG this is good! Ok sir you and I need to talk! lol. That is of course you are cool with throwing out some pointers. I wish I could help. I can't map or do textures to save my life. Registries I can do easily though. 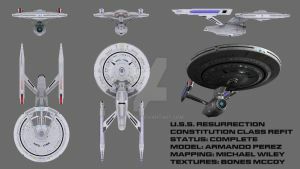 My friend, Michael Wiley, he did the mapping for me, and my other friend, Bones from Bridge Commander, did the textures. My congrats for a wonderful model. I really enjoy working with it. Of all the poser starship models I have this is my Favorite. 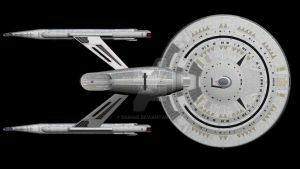 I love the Resurrection because you combined the Sovereign Class withe refit Constitution Class beautifully! 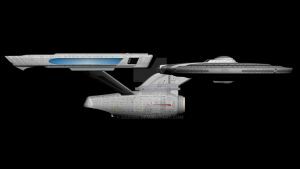 :-D I wanted to keep the ship's TMP design as intact as possible, but yet wanted the right balance of new tech in her. Of all the ships I've ever kitbashed or made from scratch, this is the one that I'll forever be proud of. I can see why, the Resurrection was beautifully done! Thank you. She was a labor of love, and trust me, she was worth every second spent on her refit. VURRY cool. 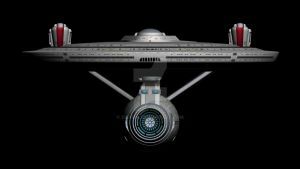 I like the design - part TMP, part TNG. That's what I was aiming for. Thanks for the comment! !